Most adults have experienced acid reflux – commonly called heartburn – at some point in their lives. But chronic reflux can lead to serious health conditions, including an increased risk of esophageal cancer. When reflux happens regularly, it’s called gastroesophageal reflux disease, or GERD. 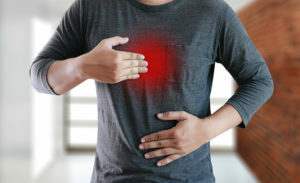 If you have mild heartburn two or more times a week, or moderate to severe heartburn at least once a week, you have GERD. And if your GERD occurs at night, it may also cause a chronic cough, laryngitis, disrupted sleep or even asthma. Over time, GERD can lead to a narrowing of the esophagus, creating swallowing difficulties, esophageal ulcers and changes to the esophagus that can eventually lead to cancer. Stephens said GERD is not something that patients should just live with. “For many patients who suffer from chronic reflux, surgery is an effective option that can improve quality of life, prevent future damage to the esophagus and eliminate the risk of more serious conditions caused by acid irritation,” he said. To learn more about acid reflux and about an innovative surgical procedure to treat it, join Dr. Stephens at an event at 5:30 p.m. on Thursday, Feb. 22 in the main lobby at Houston Methodist St. John Hospital in Nassau Bay. Please register for this event at houstonmethodist.org/events or call 281.333.8899.